Action: Exhaust Gléowine to choose a player. That player draws 1 card. Gleowine (or, if you're matthew dempsey, Gleowinny), is a pretty good card. I don't know of anyone who actually uses that single willpower stat or the two hit points, but an extra card a round with no downsides is a pretty good deal for two resources. Everytime I draw this one, it makes me happy. 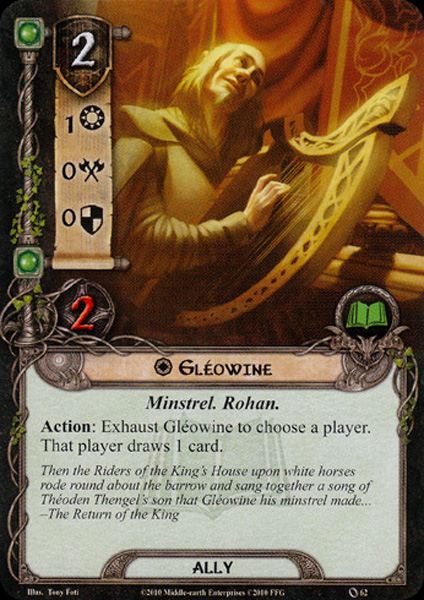 Gléowine is undeniably good card giving you 1 extra card per round for cost of two, accelerating your hand options and it even doesn't matter he is unique. He also got Rohan trait, which makes him good in rohan deck, good in multiplayer providing the card to any player and I also often use him in non-lore deck with discard mechanism and Stand and Fight. One of the best options for extra cards in play. Artwork is also very good. Verdict: 5/5.